As the new olive oil is premiering right after the harvesting, Chef Stephan Paroche from La Table du Hameau has created a special menu Friday the 8th and Saturday the 9th of December, involving the mythical ingredient of Mediterranean cuisine. Yummy. The year is nearly over and the freshly picked olives have given us a brand new batch of olive oil. 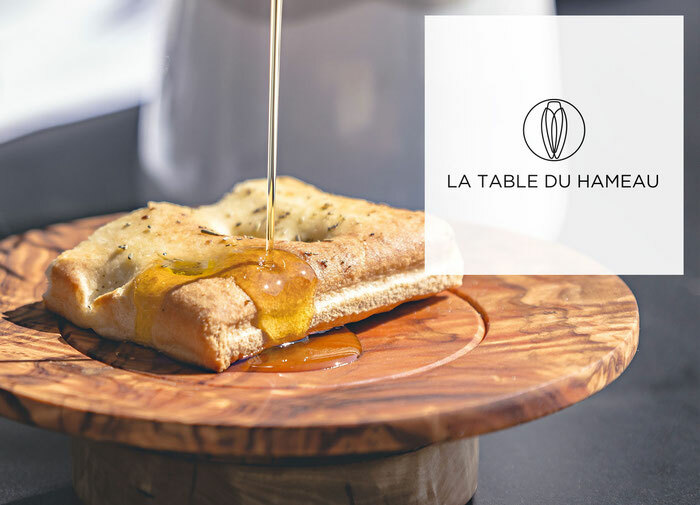 A perfect occasion for Stephan Paroche, chef at La Table Du Hameau, to create an olive oil menu from start to finish, available during a weekend only. The chef has conceived the menu as a dish and wine pairing, oil replacing wine, each one of them of different mellowing. Of course, our “Fait Maison” oil is highlithing the menu, as well as the Hameau’s neighbor, Xavier Alazar, high end production. “Our oil is green and tonic. It has a dashing taste of fresh almond and lime” First things first, the amuse bouches, a shrimp carpaccio paired with flying fish’ eggs in caviar fashion and wasabi. For starters, the chef chose the Hameau’s oil from last year’s harvest, fresh with a long finish. “It’s fruity, with a long lasting taste, perfect for salted sea bass, combined with granny smith apple, for a fresh seasoning” For the main course, Chef Paroche preferred using a mature oil, coming from Xavier Alazard. “Roe deer’s taste is powerful, we needed a stronger oil as well for the seasoning”. For the pré-dessert, Chef Paroche went back to the Maison’s fresh oil, topping a green apple granité. As for dessert, he opted for an olive oil sorbet, pairing a deconstructed fennel and citrus pie. Mise en bouche : Wild shrimp carpaccio, flying fish eggs, fruity olive oil, citrus light cream. Starters : Salted sea bass, poutargue, celeriac and granny smith apple, radish leaves gravy in a grey shrimp’s broth, Hameau’s olive oil. Main course : Venison, mushroom warm salad and vegetable roots, Xavier Alazard’s mature olive oil, pepper sauce. Pré-dessert : Apple and olive oil Granité. Dessert : Our idea of a lemon pie, with fennel and olive oil. To taste this wonderful menu in the flesh, rendez-vous at La Table du Hameau from 8 to 9 decembre.